If you like playing a fruit machine, slot machine or a one-armed bandit, then this is the app for you. This has all the features and more that you would expect to find on pub, and club machines. 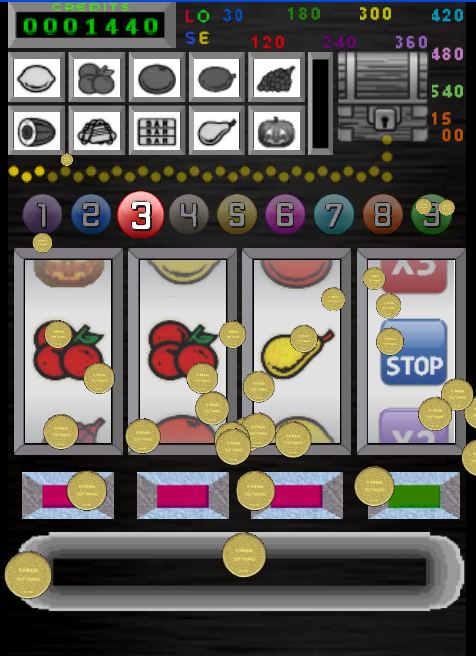 Fruit 'n' Loot is a classic 4 reel slot machine with a feature window. which includes spinwin, nudges, steppawin & fruit select. There is also an independent coin trail feature which when completed leads to an exploding coin chest of credits. There is a unique fourth gamble reel, this will spin when two fruits match on the win line, hopefully increasing your winnings. All the usual features you would expect are here including, holds and gambles. Coins are spectacularly ejected from the hopper on all winnings. There is also a menu page showing the win line credit amounts, info and full feature descriptions, plus full control over sound and speech. Please take time to review this app, as feedback helps us develop our apps, thanks. Now lets get that jackpot.